It's getting harder to condense these mosaics to 6x6 since these countries are bigger and have so much history. And there are so many beautiful photos on flickr that inspire me. The biggest reason I want to go to Cambridge is Sean McHugh and his incredible night photos. 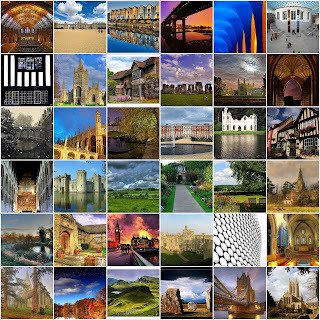 Here are some of my flickr favorites that I found from England. my grandma is from there. so I'm actually 25% British.